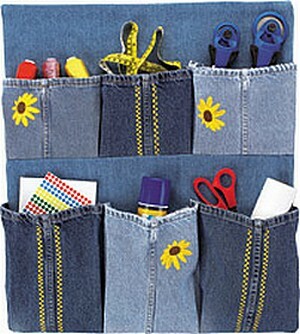 This fun denim organizer uses the legs of cut-off jeans and is a great project for summer teen sewing classes. The finished hem of the jeans creates the top of the pockets so that there is no need to bind the edge. This project can be embellished in many ways. We used machine embroidery and decorative stitches. Other options include hand embroidery, rick rack or other trims or appliqué. It could also be personalized and the pockets labeled. Coats Dual Duty Plus® All-purpose Thread (Art 200): color 5 Copenhagen or to match denim. Coats Rayon Thread–30 wt. (Art D93): color 182 Spark Gold and Coats Rayon Thread–40 wt. (Art. D63): color 51 Chona Brown were used in this project. Organizer fabric: Cut 2 pieces of fabric 22″ x 25″. 9 1/2″ high by 10″ wide. Decorate pockets as desired with decorative stitching, appliqué, machine or hand embroidery, or trims. To form each pocket row, sew the three same size leg sections together. Mark the pockets as shown for folding pleats (1). Fold solid line to dotted line. At seams, fold solid lines to seam line, do not overlap. Baste pleats in place at lower edge. Attaching top row: Mark a line on organizer fabric 11 1/2″ from top edge. Place pocket row on fabric, right sides together, with the lower raw edge of pockets against the line (2). Stitch, 1/2 inch from edge. Press seam allowance toward pocket. Bring pocket section right side up, press. Baste side seams. Stitch in the ditch using Jeans thread or all-purpose at seams in pocket row to form individual pockets (2). Bottom row: Fold pleats and baste. Place pocket section on organizer fabric, right side facing you, aligning raw edges. Baste sides and bottom edge of pocket. Stitch in the ditch at seams in pocket row seams to form individual pockets. Place backing fabric over organizer, right sides together. Stitch together, using a 1/2″ seam allowance. Leave a 1″ opening in the side seams at the top corners for inserting a dowel or curtain rod and a 6″ opening in the lower edge for turning. Trim corners diagonally. Grade lower edge to reduce bulk. Press the seams open before turning. Pay particular attention to places that are thick due to jeans seams. Turn to right side. Press. Hand sew opening in lower edge closed. Insert dowel, attach a cord for hanging. For better stability use a curtain rod and brackets for hanging. Organizer adapted from a design by Judi Kauffman. Denim Organizer © 2003 by Coats & Clark Inc. Reproduced with permission from Coats & Clark Inc. This site is not endorsed by Coats & Clark Inc.